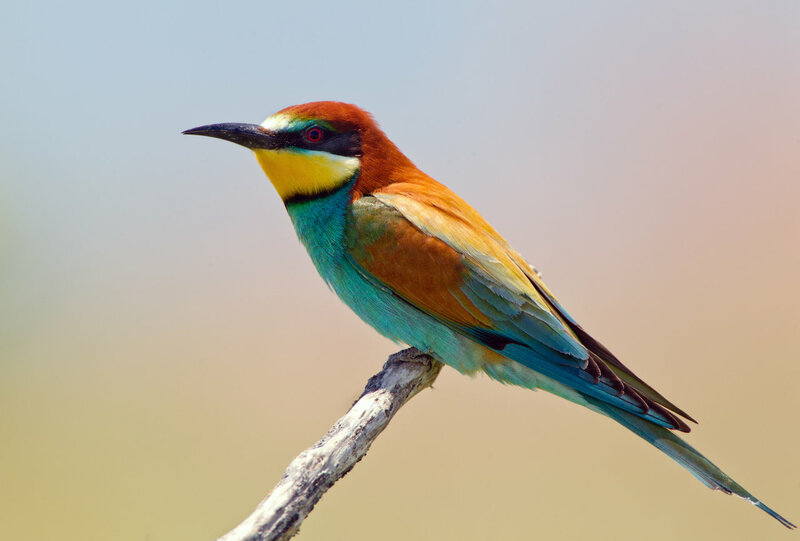 The European Bee-Eater is another of our exotic summer visitors, though not as shy as the Golden Oriole. Every day from June-September, flocks of Bee-Eaters fly high above the valley, their fluting calls of ‘prroop prroop’ are easily identifiable. They are from the same brilliantly-patterned family as Kingfishers, Rollers and Hoopoes, and do eat bees and wasps in flight. Apparently they wipe away the sting before swallowing. They nest by burrowing into sandy banks, some summers we catch a sight of them flying in and out of small burrows in a sandy bank way over the other side of the valley. Only visible with binoculars. We have in the past confused them with Rollers. 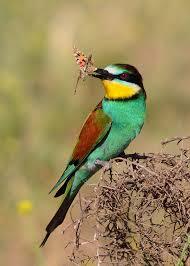 To be clear, Bee-Eaters have rusty red-brown backs, a yellow throat, and greeny-blue wings and underside. To watch a video and listen to Bee-eaters, click here. 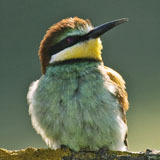 Read this wonderful article in National Geographic about the European Bee-eater. This entry was posted in Nature and tagged Andalucia, birds, living abroad, nature, Sandra Danby, Spain, travel on December 31, 2014 by sandradan1. Could easily be mistaken for a fairy! Happy New Year to you as well, Sandra. Hoping to get back into blogging more often – meaning writing my own posts and reading, responding to others. But realistically, I’m mired in something I have to take care of, and coupled with computer problems (didn’t work for weeks at a time) – just had to let some things go for a bit. Let me wish you much success in your writing. You’re working on a sequel to Rose Haldane’s story, aren’t you? Best wishes on that.